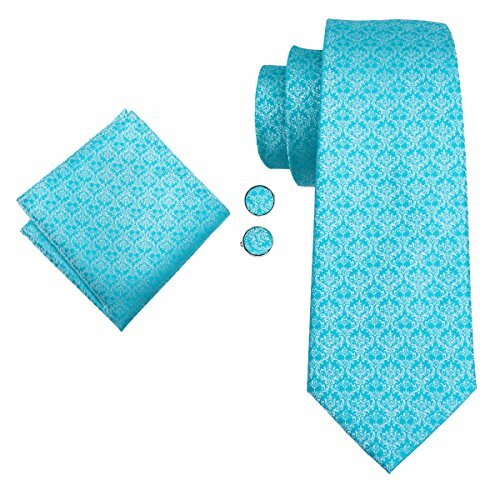 1*Tie (3.4"x 59"), 2* Cuff links and 1* Handkerchief (9"x 9"). If you are not satisfied with the product or the shipment, please feel free to contact us. No high quality goods are cheap? Totally wrong! Superior quality with adorable price, for we are professional in NECKTIE. Perfect gifts for gentlemen, fathers, husbands, boyfriends and business partners. For more high quality tie with unbeatable price, please click our Brand name"Hi-Tie". Here are more than 1000 styles for your choice. If you have any question, please feel free to contact us, we will guarantee you 100% satisfaction.